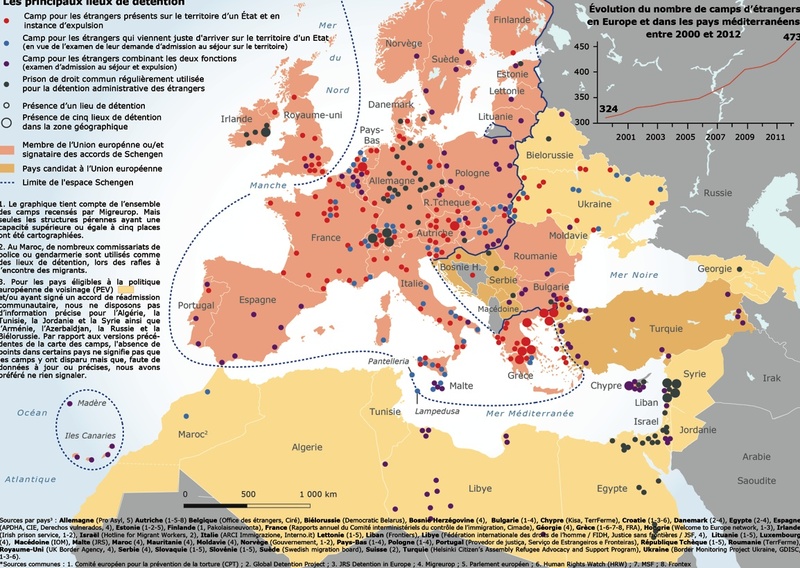 The illegal immigration movements from Asia and Africa to European countries are changing due to the nature of economic developments in Southeastern Europe, which is one of the main human trafficking routes towards the EU. The deteriorating financial situation most notably in Greece along with the tightening of border controls and the involvement of the EU calling for stricter measures, has shifted priorities and altered the tactics of the trafficking networks, which are all related to transnational criminal groups. 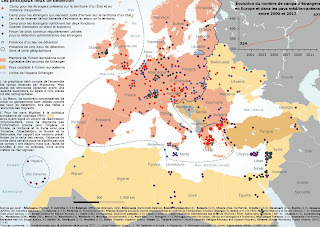 (- 25% GDP between 2010-2013) there has been a trend that involves the transfer through organized criminal networks, of illegal immigrants from Greece (mainly) to Central Europe through the Balkans and especially FYROM. This trend is supported both by the rapid increase of arrests concerning these new routes, as well as, by the notifications of both Bulgarian and FYROM authorities and the latest FRONTEX assessments on the issue, as well as, a European Parliament review on the illegal immigration issue. The human resources involved are from a variety of nationalities involved in this type of criminal activities. Apart from locals, there has been a noted increase in the arrest of human traffickers of Afghani, Syrian and Pakistani descent. The coordinating centers for this activity are located in Athens, Thessaloniki, Skopje, and increasingly are to be found in Bulgarian and Serbian provincial cities, following a route along central Europe. The main methods being used are transfer through bogus tourist companies and buses, commercial Lorries and trucks, designated taxi fares and often on foot by small groups of immigrants. Furthermore, according to FRONTEX "rising numbers of detections at the EU external border with West Balkan countries can be attributed to the successfully negotiated free-trade agreements which in combination with visa-free travel between Turkey and all the countries of the Western Balkans were followed by expanding direct air links between two regions and increased flows of regular passenger. This explains why Turkish nationals represented by far the most refused nationality at regional air borders (a significant increase in detected illegal border crossings of Turkish nationals trying to enter the Schengen area from Croatia or Serbia was also reported)". Another important trend is the significant increase in the arrests of criminals forging travel documents for the purposes of illegal immigration. Approximately since 2010 and up to date more than 5 people each week are being arrested in the Athens region alone. The vast majority are Iraqi (Kurdish descent), Pakistani and Syrians. The travel documents being forged are mostly German, Scandinavian and Italian passports-visas. During high tourist season which starts in late spring and lasts until autumn there are regular incidents of passport and EU id's theft by "spotters" which work for the trafficking networks and are specialized in this illicit sector, by working along with the forgers. A fake passport which rarely is being undetected in any border control costs around 300-500 Euros in the street black market in Athens, whilst bureaucratic papers from state authorities that can be used for travel purposes and which have been obtained illegally by Greek municipal authorities can cost a few thousands. For that reason, several countries, and most notably Germany have increased border controls even within the Schengen zone and specifically target flights arriving from Greek airports by stopping and checking passengers travel documents, thus in effect terminating the free movement of people and the aforementioned European treaty. Another counter effect has been the denial by Netherlands, Germany and Austria to accept Romania and Bulgaria into the Schengen Zone citing fears of a mass movement of immigrants passing through these countries and onwards into Northern EU states. Moreover, it should be noted that over the past three years in Greece criminal networks involved in narcotics contraband are increasingly being involved in travel forgery and in many respects these two illicit sectors have become mixed and consequently dominated by drug traffickers. Almost in all cases where forger's hideouts have been detected, significant amounts of narcotics were also been deposited there as well. Another trend in the increasing involvement of European citizens in assisting illegal immigration to the EU through Greece via "bogus marriages”. The process under which marriages are being used for immigrants to acquire legal residence rights, consequently be able to travel and establish themselves freely into the EU is a complicated procedure which puzzles the authorities, since it is often hard to prove whether a marriage - although legally signed - is genuine or not. There are though several indicators which can be applied especially in the case of Southeastern European countries. -Multiple marriages between immigrants and residents in a short period of time in a specific municipal hall by the same vice-Mayor or other state official. It has to be noted that recently in Greece, an extensive criminal network composed by Greeks, Georgians and Bulgarians was uncovered that was facilitating the legalization through marriage of Georgian organized crime figures. The Police investigation uncovered various links with state officials in the municipal level, along with involvement of attorneys and travel agencies that managed the one-day transfer of "brides" to Georgia to marry a local resident there so he could have his papers in order even before he arrived in the country. A similar trend to the above is the assistance in the transfer of illegal immigrants from Greece to the EU and to other Balkan countries by EU citizens with their own cars bearing EU plates, so as to pass without border controls. German, Polish, Czech, Italian and French citizens have been arrested lately mostly in Patras and Igoumenitsa ports on their way to the ferry line to Italy. Similar cases with mostly Central European citizens, have been observed since 2010 in peripheral Island airports in Greece during tourist season that operate mostly with charter flights. The most favored destinations were small EU airports such Bergamo in Italy, whilst in 2011 a Greek-Italian-Moroccan network tried to transfer "clients" by using private jet flights from the peripheral Greek airport of Kavalla to Italian ones. Lastly, a trend which goes in a different direction is the tightening of border controls and the repatriation of illegal immigrants. Since early 2012 and January 2013, around 23,000 immigrants have been repatriated from Greece to their countries, mostly: Pakistan, Iraq, Algeria, Nigeria and Bangladesh. In 2011 the number according to the Greek Police was 18,000 people and another 7,000 are scheduled to be deported until early summer 2013. What’s interesting as well, is that a number estimated around 5,000 has already been arrested and placed under judicial control is specially designated detention centers and a considerable number has requested "laissez passer” documents to travel back to his original destination. The number of immigrants in transit between Greece-FYROM-Serbia, Bulgaria, Romania is hard to be calculated, but can be considerable, perhaps more than 30,000 people at any given moment. 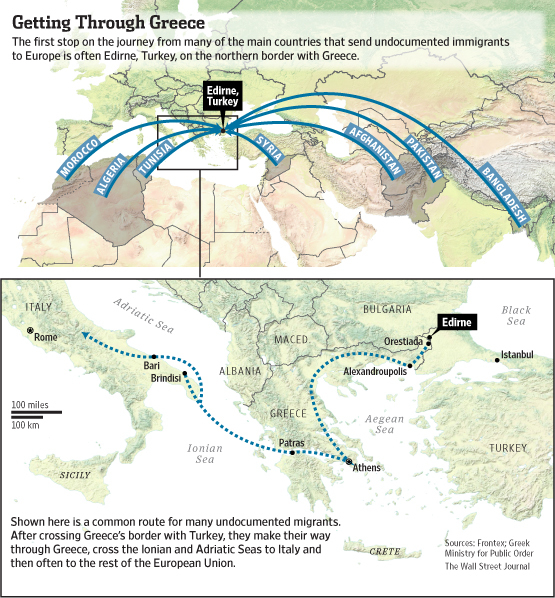 The total number of illegal immigrants in Greece -which is the Southeastern European trafficking epicenter-, is presently around 400,000 people with incoming flows decreasing rapidly, some minus 45 per cent for 2012 and up to date. The Greek Interior Ministry believes that around 30,000 people entered the country illegally in 2012 instead of 55,000 in 2011 and the expectations are for an at least further 50% drop the present year. Due to the deteriorating job market in the country the trend that should be expected in 2013-2014 will most certainly involve more repatriations of voluntary nature, as well as, further buildup of immigrants "in transit & in limbo” communities in Southern Balkans, while trying to move out of Greece on their way to Germany-France and Northern European destinations.